Fish comes back from endangered list! 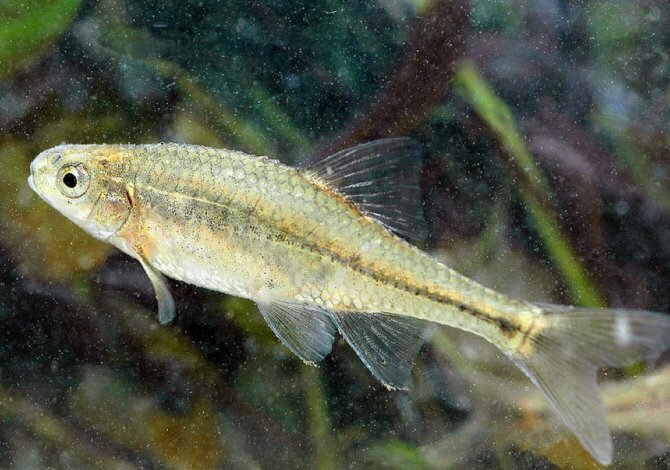 Follow the story of the Oregon chub, Oregonichthys crameri, on the IUCN red list of threatened species, and the depressing tale makes familiar reading. After a severe decline through the 1950s and 60s, the fish eventually cropped up on IUCN as 'rare' back in 1986. They held that post for another four years until continued decline shifted them up to 'vulnerable', a dangerous place to be for any species. And there it remained for 12 years, until at last, having fought back with abundant populations, the fish now lists as 'least concern', just like you, me and pigeons. The North American fish rated even higher on the U.S. Endangered Species Act, hitting full on endangered status, but now, 21 years later, is considered to have recovered. That’s not to say the fish are totally out of the woods. The U.S. Fish and Wildlife Service plans to monitor the species for another nine years, ensuring populations continue to grow, before taking a real sigh of relief. As Oregon director of Fish and Wildlife Paul Henson says, "They can leave the hospital and get to be an outpatient." The fish were placed into peril by — surprise, surprise — human activity, as the beaver ponds and swampy homes it normally inhabits were drained away to control flooding, as well as make space for farms and cities. As predator fish were also introduced to their waters from elsewhere, the pressures grew. Bullfrogs, Bluegills and Bass loved fattening up on the little fish, and populations were hit hard. Before Europeans settled, waterways in the region were rife, and the fish estimated in numbers of perhaps a million. But by the early 1990s, there were only eight places left where they were known, and their combined numbers barely scraped 1,000 individuals. After their recovery, around 160-180,000 fish are now thought to reside in at least 80 locations. To their advantage, the chub are not 'obstructive' species, competing with well-financed or anthropologically important projects. Unlike the Zebra plecs of South America, the chub aren’t battling it out with massive hydroelectric dams, and it turns out that this works in their favour. To recover the fish, partnerships were established with landowners to restore key habitats. After reassurance that economic activity wouldn’t be affected, introductions and management began. The U.S. Army Corps of Engineers were even called in to alter dam releases the more closely resembled natural river flows. It’s estimated that $2 million has been spent over the last two decade for research, in-ground improvements and monitoring, with funding supplied by the federal government. Eventually the delisting target was reached in 2012, after it was ascertained that numbers of at least 500 fish were found in at least 20 of the populations. Furthermore, the numbers were stable and/or increasing over a seven-year period. Furthermore, handfuls of other protected species such as Salmon, Red-legged frogs and Western pond turtles have also moved into the restored habitats and are settling fast. The news comes as a promising reprieve to stories of extinctions and overfishing. All we need now is for a few other countries to take note and understand that maybe, just maybe, eco systems and habitats can be as important, if not more so, than things like palm oil plantations.